The work of Hugh Newell Jacobsen-one of America’s most acclaimed architects-is infused with a rare sense of clarity and elegance. He is best known for his modern pavilion-based residences-compositions of simple, gabled forms that are rectangular in plan. Unlike other second-generation modernist architects who revisited the iconic European houses of the 1920s or the American shingle style of the nineteenth century, Jacobsen drew inspiration from the vernacular architecture of the American homestead. His grand yet intimately scaled pavilions recall the barns, detached kitchens, and smokehouses-the outbuildings-of rural America. Jacobsen has won more than 110 awards for design excellence during his 40-year career. Born in Grand Rapids, Michigan, in 1929, Jacobsen earned a Bachelor’s degree from the University of Maryland in 1951 and a Master’s degree in architecture from Yale University in 1955. Prior to attending Yale, Jacobsen was a portrait painter working in a variety of media. This work in figurative painting may explain why Jacobsen, though trained as a modernist and influenced by the work of Louis I. Kahn and Philip Johnson, maintained an affinity for picturesque compositions and traditional building forms. When Jacobsen opened his own office in Washington, D.C., in 1958, most of his early commissions were flat-roofed modern houses. But by the early 1960s he began to look beyond the vocabulary of mainstream modern architecture to explore the roof plane as a sculptural element. The roof of his Beech House (1963) comprises a series of pyramidal forms that define the house’s distinct spaces, from the public living and dining areas to the more private bedrooms. Jacobsen had replaced the traditional single, large roof with multiple, smaller roofs-articulated shapes that break down the apparent scale of the house. Jacobsen continued to refine his vocabulary of building shapes and materials in the late 1960s and early 1970s. It was not until 1974, with the Blumenthal House, however, that he began to create his characteristic gabled pavilions-a compositional device that is still his signature building form. Through projects such as the Buckwalter House (1982), a series of pavilions that telescope from large to small, Jacobsen uniquely combined elements of traditional and modern architecture. The main facade recalls a colonial farmhouse, but the mirrored-glass sides, steel-reinforced balloon frame, and open, light-filled interior are clearly modern. 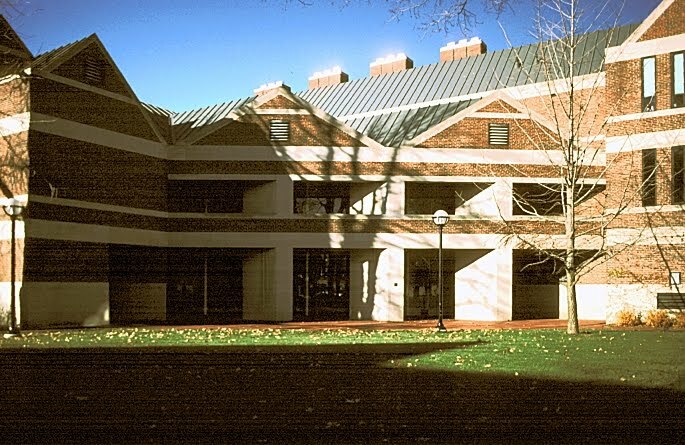 Jacobsen has also designed a number of large-scale, commercial and institutional structures such as the library for the American University in Cairo, Egypt (1981), and the University of Michigan Alumni Center in Ann Arbor (1982). And while he has continued to refine his characteristic vocabulary in the design of new structures, he has also been an active preservationist. His addition to the United States Capitol (1993), as well as his renovations of The Renwick Gallery (1972), the American embassies in Paris (1984) and Moscow (1984), and private residences, demonstrate his ability to transform a building while respecting its historic fabric. Jacobsen has made his most important mark, however, in the realm of freestanding houses. Many architects have experimented with the idea of the modern home in the second half of the twentieth century, but few have composed as eloquent an essay as Hugh Newell Jacobsen.